For many years, I have been interested in learning about my ancestors – those without whom I wouldn’t be here – those whose genes may have affected me in unrealized ways. My parents told my brother and me many stories about their families and childhood when we were little, and since then I’ve asked them lots of questions. Assuming at least a few of my descendents will someday feel a similar interest, I’ve decided to share what I’ve learned. With today’s tools it’s so much easier to find information that took a great deal of effort even just a dozen years ago. So I can borrow not only from my own family’s storehouse of memories, but also from those of complete strangers who are related in some way. Scientists tell us that every time we remember an event, we change it slightly. And everyone remembers things from just a little different perspective. So what follows is, if not the truth, at least a reasonable facsimile. I hope it will be entertaining! Like all who came to live in America, my forebears had the spirit of adventure, the restless, pioneer spirit that pushed them ever westward, across the Atlantic Ocean, to the seaboard states of Connecticut, Pennsylvania, Maryland, and Virginia, on to the rich midwesterm soil of Ohio, Kentucky, Indiana, Iowa, and Kansas, and finally all the way to the west coast. Let’s begin the story on the far left branch of the ancestral tree. In Ballyclare, County Antrim, North Ireland, a young man named Robert McBroom, born in 1766, decided to leave his home and family and sail to America. Other McBrooms have told me that “all” McBrooms originally came from a small area of southern Scotland, around the parish of Kirkcudsbright (it means “Chapel of Cuthbert”) at the mouth of the River Dee. So I am guessing that Robert’s family may have gone to Ireland to serve as landlords for English estate owners, as so many Scotsmen did. Whether his voyage was an adventure or a necessity, I don’t know, but upon arrival in Pennsylvania not long after the Revolutionary War, he met a young woman named Elizabeth Catherine “Katy” Kinzer. Their child, named Robert, was born in Dutch Creek Fork, Washington County, Pennsylvania on April 3, 1795. Records do not make clear that they were married, and indeed, in 1798 he married a Nancy Agnes Jamison, with whom he had a large family, including another son named Robert. 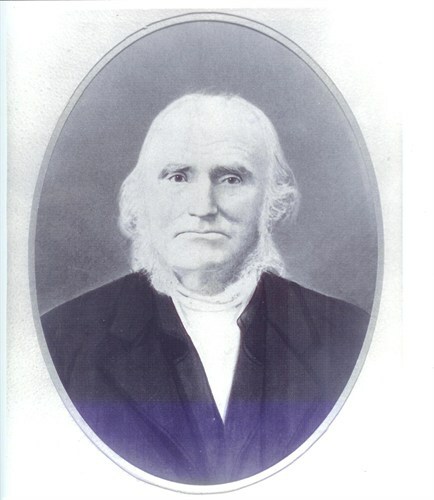 The original immigrant Robert, my 3g-grandfather, died in 1853 in Brooke County, West Virginia. It is through that first son that I trace my ancestry. When Robert was in his late teens, together with George Kinzer (probably a cousin or uncle), he decided to push west. Perhaps, if he was really an illegitimate child, this was an effort to escape his past. 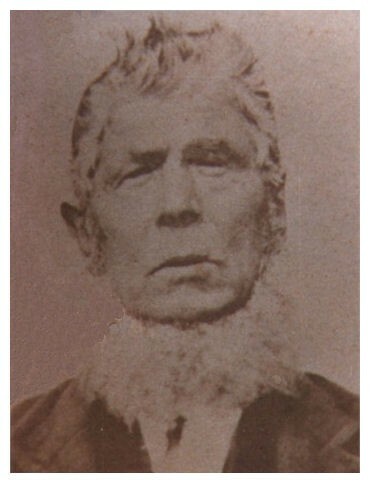 They first settled in Pickaway County, Ohio, but when he was 20 he moved on to Hocking County and came to Laurel Township.1 Here, a year later, on August 15, 1816, he married Nancy Vincent Cantwell. Now it is necessary to go back and pick up another strand of my ancestry. Matthew Beckwith, born around 1610 in Yorkshire, England and married to Elizabeth Mary Lynde, arrived in New London, Connecticut, in time for the birth of their son, John in 1665. John married Prudence Manwaring around 1688, and their son, Jonathan, born two years later, married Elizabeth Waller on February 11, 1712. In 1721, Jonathan and Elizabeth welcomed a son whom they named Nehemiah. All of this occurred in New London, but it seems that Nehemiah got “itchy feet” which took him to Dorchester, Maryland, where he met and married Mary Thomas in 1748. There they had a daughter, Mary Beckwith, who married Josiah Cantwell in 1791. Josiah’s parents were Edward Cuthbert Cantwell (1737-1767) and Mary Vincent Cantwell, (1740-1831), who were married in Baltimore, June 11, 1761. Josiah’s grandfather John Cantwell (1708-1778) married Mary Birchfield (1716-1744) and her grandfather came over from Wales, so I can claim a drop of Welsh blood! It is even possible that some of these ancestors living in Baltimore might have been Catholics. Josiah, himself, was born July 25, 1758, and he became a successful land speculator. Successful land speculation meant finding the land first! He staked out claims, usually at no cost, to hundreds of acres of uncleared lands, and then protected his claims by riding horseback from Maryland to Ohio. He was a woodsman who knew good land when he saw it, and he laid claim to it in every state through which he passed. He is described as “a woodsman, tough, brave, and honest.” Part of his land holdings included Laurel Township in Ohio. Josiah and Mary’s daughter, Nancy, had spent her girlhood in the settled, civilized comfort of Maryland’s Eastern Shore. But perhaps she was traveling with her father on one of his rounds, or maybe he had moved to Ohio, or he had decided the new settler Robert McBroom would make a good son-in-law and he persuaded her to come out and meet him. Whatever the case, Robert and Nancy, my great-great grandparents, were married, and Josiah gave Mary a square mile of land in Laurel Township for a wedding present. This land included the area known today as Cantwell Cliffs. It is the most northerly of the six parks that make up the Hocking Hills State Park on Route 374, turning west off Route 33 at Rockbridge, Ohio. These caverns, caves, and rocky cliffs, amazing stone formations, were formed by erosion through the centuries. The Mingo and Shawnee Indians found refuge from their enemies here until driven out by the English in 1774. Nancy found pioneer life in the wilderness primitive and crude, and it was a big adjustment. When she had to ride horseback through the trackless forests to deliver messages to the men who were clearing the land, she said she feared the wild hogs even more than the bears and wild cats! She bore 15 children to Robert, 13 of whom grew to adulthood. In order of their birth they were named: Joseph Cantwell, John Kinser, Malachi Vincent, Elizabeth Hewitt, Robert Mortimer, Hester Ann, James Gilruth (who died young), Minerva Priscilla, Edward Cuthbert, William Henry, Greenbury Stewart, Lewis Asbury, Mary Margaret, Nancy Jane, and Lucy, who died in infancy. The first school in Laurel Township was held in their log cabin. The first school house was built in 1829; Robert was the first teacher and taught for many years. Many of his descendents, including my Aunt Thelma McBroom, became teachers as well. Robert was a staunch Democrat, and in the first election, held in the log schoolhouse, he was elected Justice of the Peace, an office he held for 30 years. Robert and Nancy were Methodists, and the first Methodist sermon was preached in their cabin. Nancy enjoyed entertaining the Methodist circuit riders. Two of them, Rev. R Jones Greenbury and Rev. Francis Asbury, made the McBroom cabin their headquarters, and two of the McBroom’s sons were named after them. Later, two of their grandsons became ministers. They had cows and hogs, which they would butcher each fall and cure the meat in a smokehouse. “In addition, a great hollow mound of earth was built to store a supply of cabbages, turnips, beets, and other vegetables grown during the summer season.” And they had over 100 maple trees that provided syrup and sugar every spring. A cave on the McBroom farm contained saltpeter for gunpowder. The McBroom family has several cemetaries. Nancy, who died on July 26, 1880, and Robert who died a year later on September 23, are buried in the northeast corner of a family graveyard near the cliffs. Their final resting places are marked with small sandstone headstones from which time has long since erased the inscriptions. But rubbings show that Robert’s says “Died the Death of the Just” and Nancy’s says “Her Charity is Remembered. 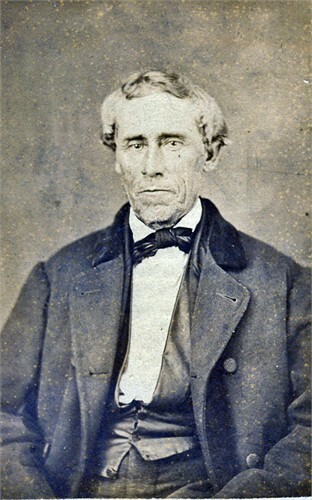 Robert and Nancy McBroom’s third son, Malachi Vincent (note that Vincent is carried on from his mother and grandmother), born December 19, 1819, was my great-grandpa. On October 16, 1842, he married Eliza Ann Carroll, the daughter of James and Rachel Carroll, who was also born in Hocking County on July 27, 1825. (I don’t think that’s where I got my name – my dad said he named me after a friend of his who died). Apparently, Malachi, who must have chosen the 40 acres when he came of age, and Eliza Ann didn’t stray far from home, as they were buried in the same McBroom family cemetery as Malachi’s parents. Malachi died July 10, 1899 and Eliza Ann died July 17, 1897. But before that they raised a big family of ten children: James R, Wesley Morris, Elizabeth Rachel, Nancy Jane, Lewis Asbury, Mary Margaret, Joseph Darius, Greenbury Vincent, Hester Rowena, and Laura E. And their seventh son, Joseph Darius, born August 25, 1858,was my grandpa! I wish I knew more about Grandpa’s early years. I know he taught school for a few years. As a romantic, I’m imagining a youthful sweetheart who either died or left him and broke his heart. Whatever the story is, it wasn’t until he was 30 that he and his first cousin (their mothers were sisters), Mary Edna Hastings (1870-1903), crossed the state line into Kentucky to get married in 1888. A few years later, they moved to Wichita, Kansas, where he bought land and started farming. Again, I’m guessing, but perhaps Edna, as she was called, was not in good health, because it was not until ten years later, in 1898, when Joe was 40, that their first daughter, Agnes Maye, was born. Edna’s niece, Norah Hastings, came out to live with them and help her. Five years later tragedy struck, and Edna died giving birth to twins, who also did not survive. Joe, a widower, began urgently looking for a new wife to take care of him and his little daughter. Agnes. As a member of the Board of the Kansas Sanitarium (an Adventist institution), his most fruitful area of search was among the student nurses. It was there he found young Jessie Roberts. And here our story must pause, as we move a little to the right on the family tree, to unwind the strands of Jessie’s family tree, beginning with the family of her father. I think I answered your comment by email, but I’m not sure. I’ve been down with some health problems, but am getting better and trying to catch up on loose ends. I haven’t done anything on my blog for a couple of years, but was reminded of your comment when I got another comment yesterday. It sounds like the Robert McBroom who is your ggggrandfather, is the one who apparently fathered a child, Robert, out of wedlock (records are not very clear) with Katy Kinzer in Washington County, PA in 1895, and then, three years later, married Nancy Jamieson and had a large family, including another son named Robert. Do you trace your family through the McBroom-Jamieson branch or the McBroom-Kinzer branch? PS My brother is also Ron McBroom.